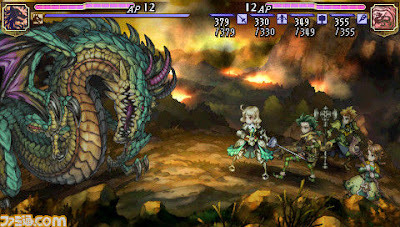 That was my exact reaction upon seeing the screenshot below--which was taken from Vanillaware's just-announced PSP RPG, Grand Knights History--for the first time. Vanillaware is the tiny, Tokyo-based developer responsible for such eyegasm-enducing games as GrimGrimoire, Muramasa: The Demon Blade and Odin Sphere, by the way. I'm currently looking forward to the somewhat-awkwardly titled Grand Knights History even more than I looked forward to the PS2 and Wii titles above, though, because it's supposedly going to be a turn-based RPG. Oh, and even better: It's going to allow players to customize the appearance of their party members. For more information on this title, check out these two posts (here and here) over at andriasang.com and this NeoGAF thread. OOooooooooooooh, indeed! I love customizable RPG characters! Me too, Justin! I can't wait to see more of this one -- and see it in action, especially. I have a feeling we might actually see this one.